Encore Properties of Newton, which owns several buildings on Washington Street at Langley Road, has filed plans to replace them with a five-story, 37-unit condo building that would include ground-floor retail space. Read more. Sept. 5 was last call at the Last Drop for one Oak Square man after a series of incidents that left him with a bloody, possibly broken nose and a bartender losing his job there. Read more. Architect's rendering of 99 Tremont St. 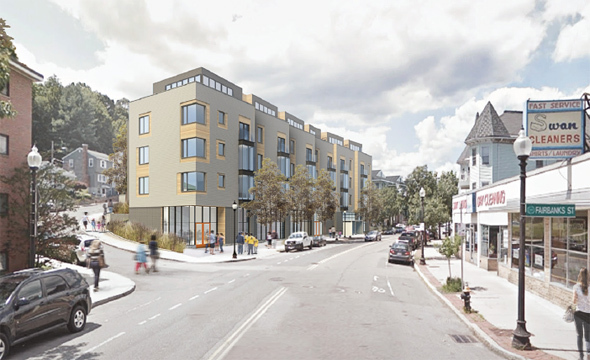 Developer Jim Keliher had two pieces of good news for members of the Brighton-Allston Civic Association last night: He's decided to sell the 62 units at his new two-building complex at 99 Tremont St. in Brighton as condos rather than rent them as apartments - and he will include language in the initial condo-association rules that purchasers are barred from renting them out on Airbnb and similar services. Read more. 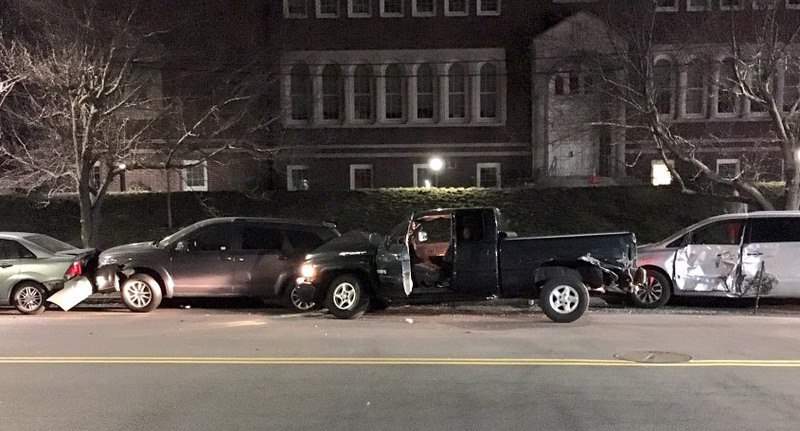 WFXT reports on a crash on Washington Street at Dickinson Road in Brighton tonight that sent two women to the hospital. 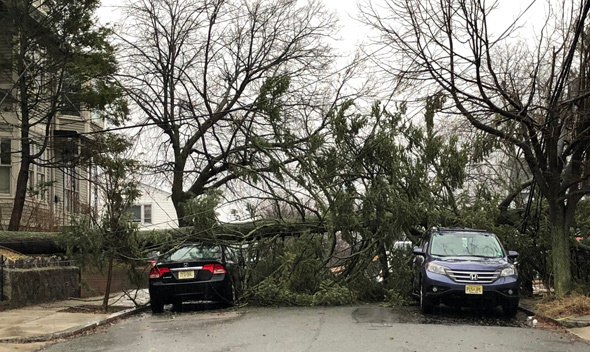 The driver may have abandoned his vehicle and fled on a T bus. The truck was flying and smashed into 4 cars, then the driver took off running! UPDATE, 2 p.m. Found at a gas station in Newton. Among the occupants of the house at 72 Perthshire Rd. in Brighton that went up in flames last night was Layla the dog, who ran away and hasn't been seen since. 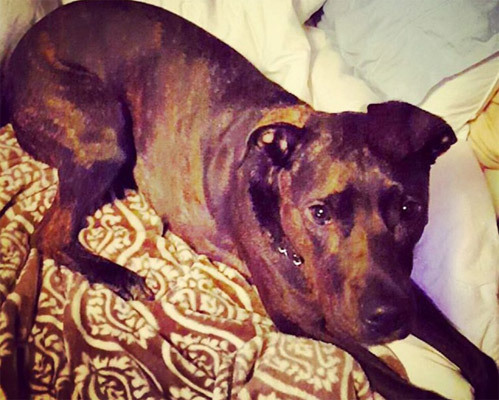 She's described as a shy, four-year-old pit bull. If you spot her, don't try to chase her, but instead call the number at the link. 72 Perthshire fire. Photo by BFD. A fire reported around 7 p.m. at 72 Perthshire Rd. quickly went to three alarms and caused an estimated $500,000 in damage, the Boston Fire Department reports. Fire Investigators determined the cause as careless disposal of smoking material. Point of origin; 2nd floor rear porch. Boston Police District D-14 reports 27 break-ins in the Oak Square section of Brighton since mid-December. Read more. Heather reports the driver is OK after this rollover on Washington Street at Matchett around 6:45 p.m., but that the street is now closed for the investigation and cleanup. 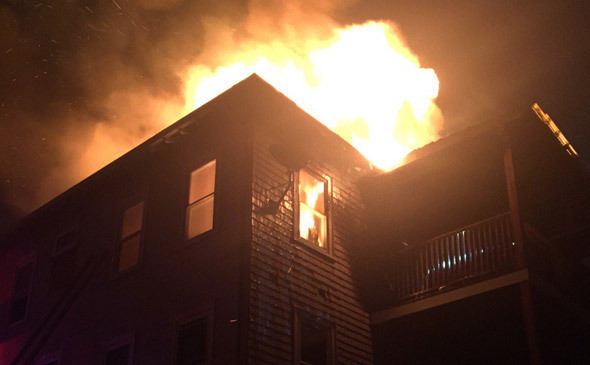 A fire that broke out around 1:30 a.m. at 40 Champeney St. went to two alarms, did an estimated $500,000 in damage and sent one firefighter to the hospital for evaluation, the Boston Fire Department reports. The cause of the fire, which broke out in the rear of the building, is under investigation, the department says. Read more. If you were in it, you know. Special note: A three-alarm fire on Tremont Street in Newton overnight left traffic a particular mess between Newton Corner and Oak Square. KWAPT shows us the scene at the Castlebar this morning. Boston Restaurant Talk reports the demise of the Castlebar, the latest neighborhood bar in Boston to close. Driving through Oak Square this morning, I noticed the little sign pointing the way up Washington Street to the turnpike. By itself, no big deal, except note that it shows a green Pilgrim hat - a remnant of the days when the Massachusetts Turnpike had its own authority and for some reason decided to use green Pilgrim hats for its logo (after discarding an earlier logo that featured a Pilgrim hat with an arrow through it and economy-sized toll cards featuring a Pilgrim who was remarkably happy given that he'd just had an arrow shot through his head). She told me the spots were hers and anyone that parked there would regret it.